Lancaster CA - #A5168723 OWNER SURRENDER! He is great with everyone, even cats but her family still decided to give her up at 13 years old. he needs your help fast, he is so confused and nervous 💔 Please SHARE for his life, he's SO precious and a FOSTER or ADOPTER would save him. I don't have a name yet and I'm an approximately 13 years old male maltese. I am already neutered. I have been at the Lancaster Animal Care Center since April 16, 2018. I am available on April 16, 2018. You can visit me at my temporary home L316. Fidonation, if you or someone you know is interested in giving this pup the forever family he rightfully deserves, please contact the Lancaster Animal Care Center at (661) 940-4191, and reference the shelter ID #A5168723. 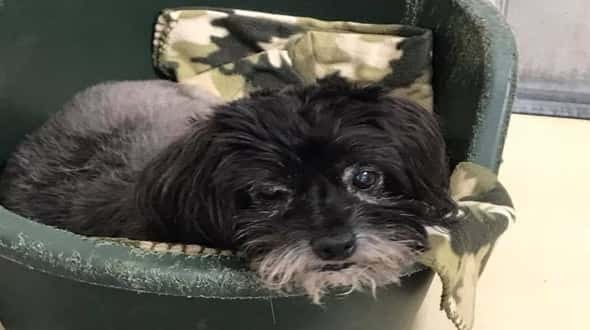 12 Responses to "Depressed pup surrendered to shelter in bucket with his favorite blanket, left with no more tears to cry"
Why are people so HEARTLESS, please share or adopt or rescue, this beautiful innocent baby who needs a place of love. Call the shelter. When I spoke with them today they said he is super friendly and good with the other dogs he is kenneled with. We at Dogzone Rescue, dogzonerescue.org in San Francisco saved him. He is in foster care as of yesterday. Looking for transport from the Lancaster shelter to San Jose, Ca. Nonprofit rescue, Dogzone Rescue, has an open foster home for him in San Jose. Want to pull immediately. We spoke to the shelter today. Contact us at dogzonerescue@yahoo.com if you can help drive. Thius is just heartbreaking! How could anyone be so cruel? Wanted to let all of you to know...this pup is now named Franklin...he's thriving at home with us in San Anselmo, CA. Has a furry brother & sister and is as sweet as it gets. We LOVE him.